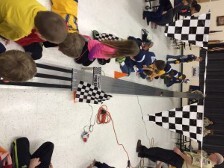 On Jan. 30, The Cub Scouts of Shamong Pack 47 held their annual Pinewood Derby at Indian Mills Elementary School. Cub Scouts remembered their motto, “do your best” as they designed, shaped, fine-tuned and decorated their cars. The event was officiated by Pack 47 Cub Master Bryan Barrett. Medford Lakes Boy Scout Troop 48 helped run the race by checking cars for compliance with the race rules, loading cars on the track, etc. Awards were given in several categories including: overall fastest in the pack, fastest in each den, most creative, Cub Scout built, best craftsmanship, least likely looks like a car and more. Each car raced in three heats, with the times recorded and averaged by our computerized track and software. The top three winning times were separated by only 1/100 of a second! Shamong Cub Scout Pack 47 contains 50 boys between the ages of 7–10. Cub Scouting focuses on building character, improving physical fitness, teaching practical skills, and developing a spirit of community service. To join, contact Cubmaster Bryan Barrett at (609) 306–2801. The group is always looking for new members, leadership and donations. Also, as a fundraiser to support our program, we are presently selling 100 raffle tickets numbered 00 thru 99 for $10.00 each. During the week of Feb. 8 to Feb. 12 if your ticket number matches the last two numbers of the NJ Pick 3 you win $100. There will be 5 winners and each ticket can win more then once. Email Gordon Donovan at: gdonovan042@verizon.net to purchase tickets.